Last Saturday Blackwater took on the veterans of Blue Stone Roller Derby in a co-ed head-to-head battle. Blackwater started the first jam with an early lead, but several Blue Stone power jams would ultimately propel Blue Stone ahead of Blackwater leading to a final score of 212 to 119. By the end of the bout the teams we bruised, beat, tired, and ready for more! Both teams had a fantastic time in their first co-ed bout of the season and were asking for more by the end. MVP awards were given to Appomattox’s own Mighty Mouse and Art Vandelay for their stellar performances jamming and blocking. 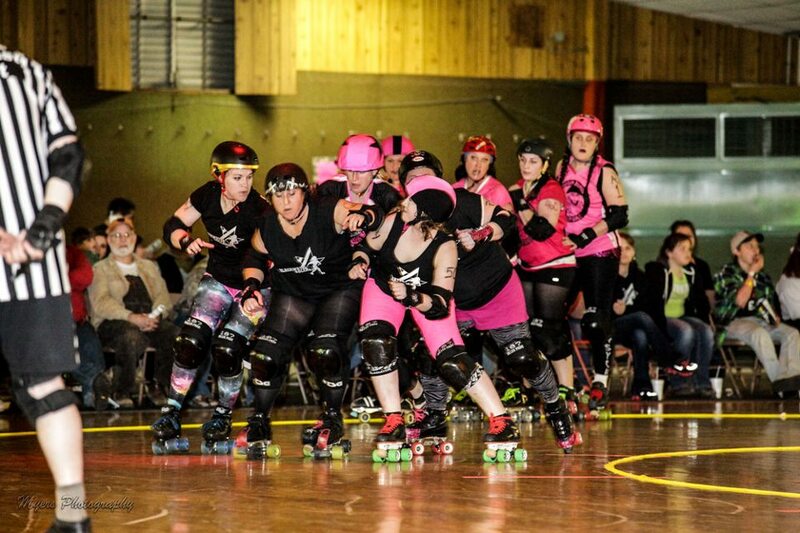 The night was also special for another reason; the rollers celebrated the birthdays of Dangerazz and Luci van Damsel during half time and again after the bout at El Cazador. Blackwater wants to give a big thank you to the El Cazador staff for being great hosts for the after party! A portion of all proceeds went to help Lynchburg Grows, an urban sustainable farm in Lynchburg. Thank you fans for helping us continue to support Lynchburg area non-profits as well as supporting local roller derby. Blackwater continues to open recruitment to all who are interested. Practice is Tuesdays and Thursdays 6:30 to 8:30 at AJ’s Skateworld in Appomattox. The first practice and free and the gear is provided so what do you have to lose? If you have any questions contact us on our Facebook page or email! Hello, derby fans! The Rollers have another bout right around the corner, but this time, we’re letting the boys play. 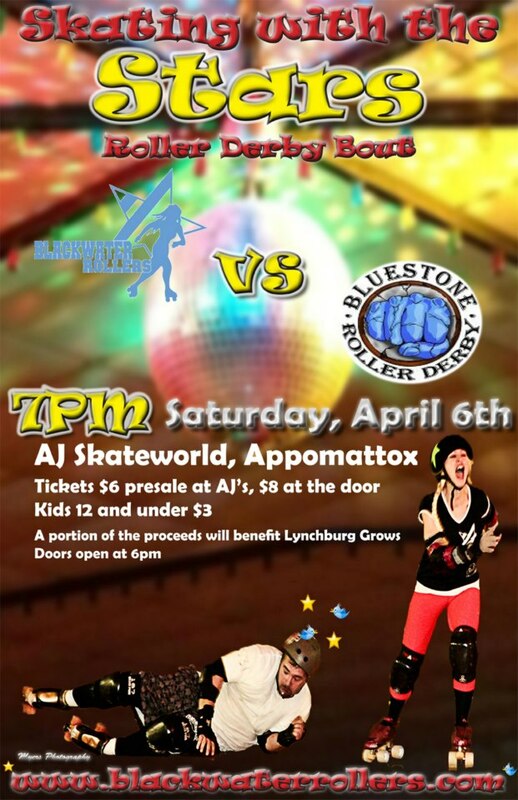 April 6th at 7:00, the men of the Blackwater Rollers will make their season premier against Blue Stone Roller Derby. Don’t worry, you’re favorite female skaters will still be there getting rough with the boys. A portion of all proceeds will go to Benefit Lynchburg Grows. Tickets are $6 in advance and $8 at the door. They’re on sale now at Aj’s Skateworld in Appomattox, drop by or contact a skater to get yours. We hope to see all of you there for our co-ed team season debut! The snow is melting, the sun is shining, and derby season is getting into full swing. We’ll be having our second home bout of the season Saturday March 23rd. We’ll be taking on the Bruisin’ Burgs, hailing from Blacksburg/Christianburg. Tickets are $6 in advance at Aj’s Skateworld and $8 at the door. 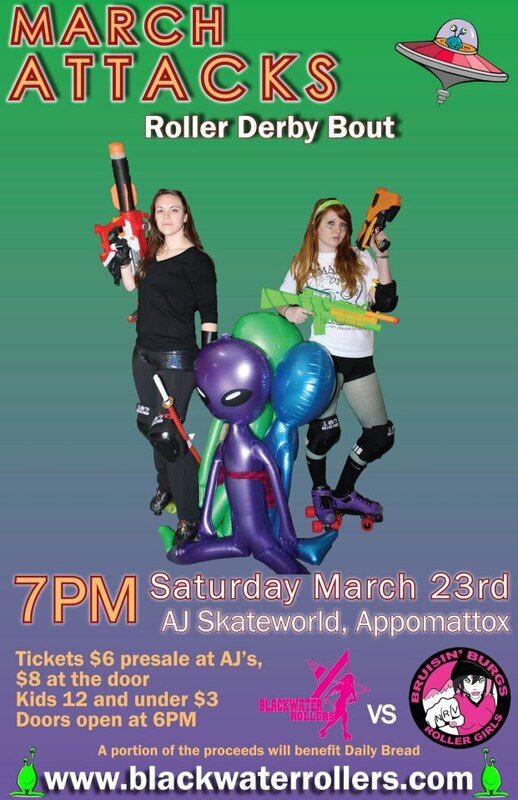 Tickets are already on pre-sale, so get into AJ’s or contact your favorite derby girl! Don’t forget that part of the proceeds goes to a good cause; Blackwater will be donating a portion of the proceeds to the Lynchburg Daily Bread. We’re looking forward to seeing all of your beautiful faces. Derby on!